When planning trips to the hills, a good weather forecast is vital. We’re very fortunate in the UK to have services specifically designed for mountain areas, but they aren’t always as convenient to access as we would like. 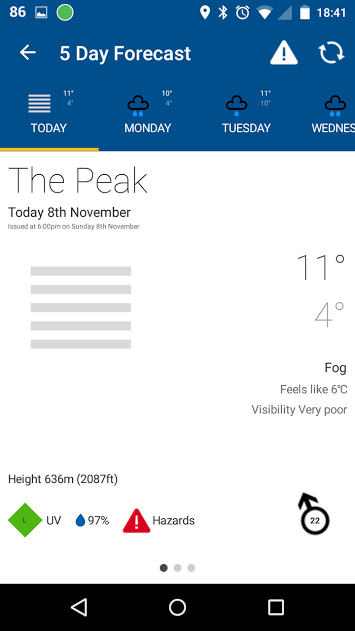 When I heard about the new Mountain Weather UK app, I was intrigued and knew at once it would be worth checking out. Before I take a look at the new app, let’s examine the options currently available. Most UK hillwalkers use a combination of weather services to get the best information. Anecdotally the most-used services are the Met Office and the Mountain Weather Information Service, both of which offer excellent information — even if the forecasts don’t always agree! Throughout the UK, many mountain pubs, hostels and campsites print out the relevant MWIS page for the benefit of visitors, and if you are using a computer then access to the information is of course easy. The same goes for the Met Office’s mountain forecasts. However, mobile access is a little different. 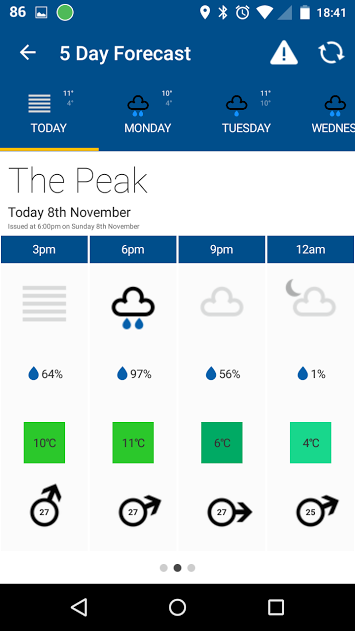 The Met Office offers its own app, but it gets updated very infrequently and has a cumbersome, old-fashioned appearance — no modern redesign here, and its look has not significantly changed in five years. I don’t use the Met Office’s official app as I have found it to be slow and unreliable. For this reason the only real option for smartphone access is the mobile Web. 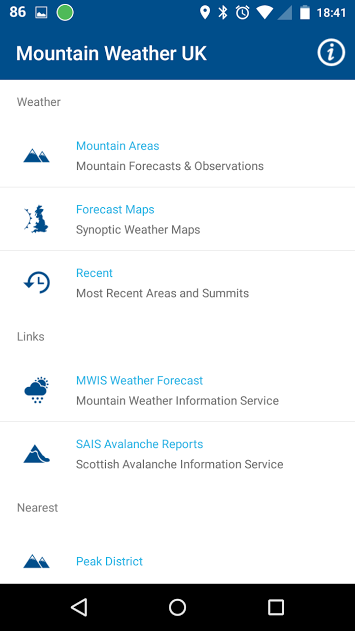 MWIS and the Met Office both offer mobile sites, but access on the go is clunky: the user either has to remember the URLs, or use folders full of bookmarks for all the relevant pages. 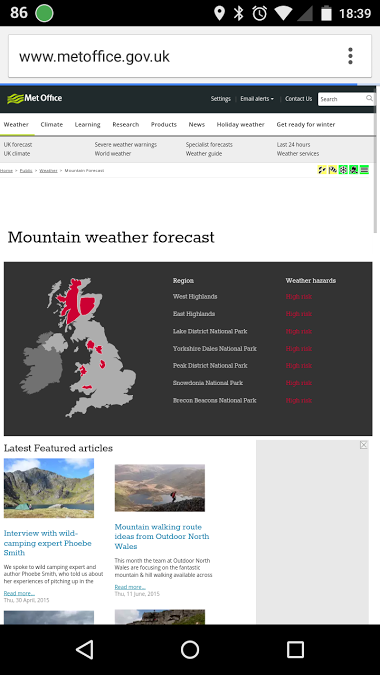 The Met Office’s landing page for mountain weather is not even optimised for mobile. What is needed is a simple and easy way of accessing all this information from mobile devices on the hill. 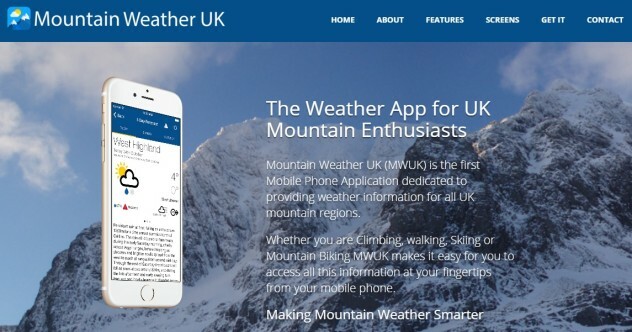 Mountain Weather UK (MWUK) is available for both iOS and Android at launch. I was one of the first Android users to download the app, and I’ve been trying it out for the last few days while I work on this initial review. It’s available for £3.99 on both app stores. Once you have navigated to the required forecast, the page presents you with a tabbed pane, allowing you to select each day in the five-day forecast as required. Views include large, clear graphics for the prevailing weather type in each view. There are also maximum and minimum temperatures, ‘feels like’ temperature, visibility, chance of precipitation, a link to predicted hazards, and wind speed. This key information is presented very clearly and occupies most of the screen for each view. There is also a large icon in the top navigation bar giving easy access to mountain hazards, and a refresh button. Swipe right and you will see a weather timeline with ‘mini forecasts’ every three hours for the entire day. The amount of data shown here depends on the type of forecast you’ve selected. For an overall mountain region you just get prevailing weather type and chance of precipitation, but for individual summits you get all of the above plus predicted temperature, wind speed and direction. The five-day forecast page for a mountain region also includes a short textual forecast with more information arranged beneath headers: freezing level, temperature above a certain height (depending on the mountain range), low-level temperature, visibility, and hill fog. This is basically the same information that you’ll find on the Met Office’s website, but it’s more simply presented here. I think users will spend most of their time on these forecast pages, but there’s a lot more here if you need it. The weather maps are very handy if you have the skills to interpret them, and the data from the mountain summit observatories is incredibly interesting — you can see live graphs with temperature, wind and other readouts. This could provide crucial information for winter climbing, for example. 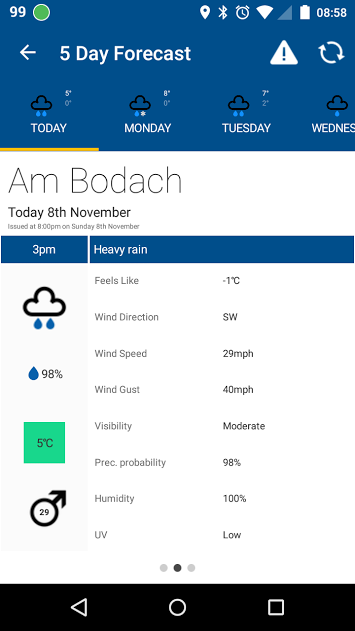 And if you prefer MWIS’s forecasts, the mobile Web pages are only a click away — no more disorganised collections of bookmarks in Chrome or Safari! I think the addition of SAIS links will also prove incredibly useful in winter. It’s a shame this information hasn’t been presented natively, like the Met Office data, but I’m sure there are good technical reasons for this. If MWIS and SAIS don’t provide an API for their data, it would be impossible. Nevertheless, it’s adequate in its current form and I think most users will get along fine with the fully integrated Met Office forecasts. How data-hungry is the app? 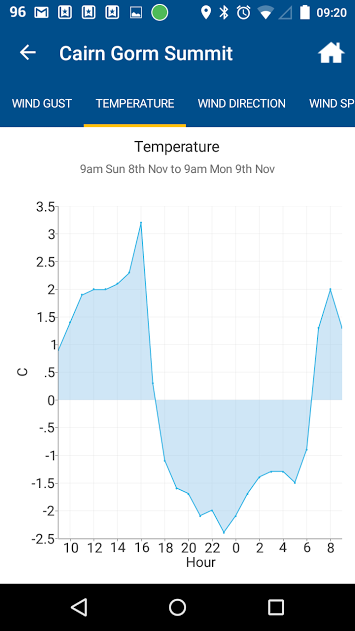 I haven’t made any scientific tests, but based on my rough estimates, using the Android system data chart, pulling down an individual forecast uses less than 100kb of data. That’s pretty good for modern software and I’m glad to say the app does not attempt to refresh everything at once; it only gets data when you have navigated to the page you want. For people who will be using this app on summits and in other places where signal is very poor, this is a great feature. Of course, the app is not perfect. It’s a very new release. In my testing so far this week I’ve seen one occasion when it froze and then unexpectedly quit, and also a few performance issues — particularly when navigating the lists of summits, which sometimes take a second or two to load. I’ve also seen a ‘no data received’ error message a couple of times when trying to access summit forecasts. As mentioned above, I would welcome full integration of MWIS and SAIS data if such a thing is possible. An obvious area for improvement would be a suite of widgets letting you pin forecasts to the homescreen (or to the widget pane in the case of iOS). I hope this is on the developer’s list of future upgrades as this would make it even easier to get the right forecast. I quite like homescreen widgets and I would definitely use this feature. There has been some Twitter chat about the app, and one suggestion that came up was the idea of an ad-supported trial version. My personal opinion is that £3.99 is worth it for such a useful app, and I dislike ad-supported freeware (ads are usually obnoxious and intrusive, not to mention a drain of battery power), but I do take the point. Users can be unwilling to pay up for an app without the opportunity to test it first. Let’s not forget that these are early days for the app. When I downloaded it, it was at version 1.0. It’s since had a bug-fix release which has improved some of the performance issues. 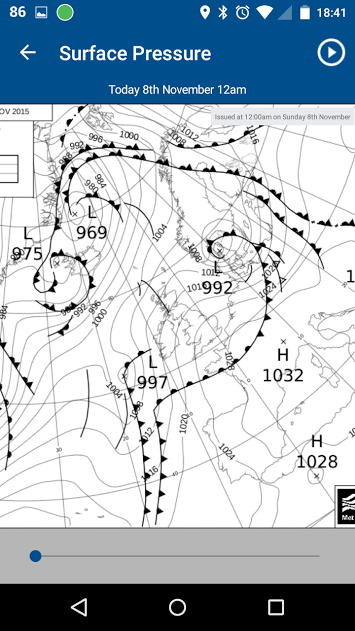 MWUK contains every kind of weather forecast the UK hillwalker or climber could possibly need. Does it bring anything completely new to the table? Not really — this data can all be found elsewhere, but that isn’t the point. The point of this app is that, for the first time, you can go to a single place for quick and easy access to this information. This is the very definition of what smartphones are for. I’m really impressed with MWUK. Its goal is simple: find the right mountain forecast for the user as quickly and painlessly as possible, without making them wade through the clunky mobile Web or find the right bookmark in their browser. Thanks to a simple and logical layout, it achieves that goal. The areas of improvement I mentioned above are either things that will come in the course of time (bug fixes) or could be integrated if the developer feels there is demand for them (active widgets). Right now, the app does what it’s meant to without bells and whistles. If you walk or climb in the UK, this app is definitely worth a look and could make your life easier. This app has now been updated to version 1.3, which has made several improvements. Amongst other things, the total size has now been reduced to 29MB, location services are suspended when the app is in the background, landscape mode has been disabled (to prevent problems with redrawing the graphics when the device is rotated), and performance has been significantly improved. It’s now compatible with Android 6.0 too. It’s a substantial update, and I’ve noticed a definite improvement in performance. If you’re looking for evidence that the developer is committed to improving the app and offering a better experience to users, here it is!